Sarasota bottom fishing is a very simple, yet effective, angling technique. Many fish live and feed on or near the bottom. Bottom structure holds bait and gamefish. Bottom fishing is an easy and effective technique that any anglers can use successfully. It places natural bait on the bottom in hopes of attracting a fish. Live, fresh dead, and frozen bait can be used. Baits vary by location, depending on the forage available locally. Bottom fishing is effective in just about every fishing location for a wide variety of species. While bottom fishing is basically dropping a bait to the bottom using a lead weight, there are nuances that will make a difference in success. Leader strength and length, hook sizes, weights, and rigs are all factors that the successful bottom fishing angler will take into account. There are several rigs that anglers use when Sarasota bottom fishing. Sliding sinker rigs and spreader rigs are two of the most popular rigs for bottom fishing. Both have multiple variations and both are effective. Sliding sinker rigs allow fish to pick up a bait off the bottom and move off without feeling and resistance. Spreader rigs suspend multiple baits at various depths just off the bottom. A sliding sinker rig consists of a leader and a sinker with a hole in it. Egg sinkers work well in this application. Egg sinkers come in many different sizes. They also roll on the bottom and do not hang up easily. Surf anglers use a device called a “fish finder”. This is a small plastic tube with a clip on it. The line passes through the tube and a clip is used to attach the weight. Pyramid sinkers are most often used by surf casters. With either rig, most anglers use the same approach. The running line is passed through the sinker or fish finder. A swivel is then attached to the end of the line. The swivel stops the sinker from sliding down. The leader is then tied on to the other end of the swivel. Leader lengths vary, but most anglers use 2′ to 3′ of leader. A hook finishes off the rig. One variation of this is called the “knocker rig”. It is just like the sliding sinker rig above, except the sinker is placed on the leader, between the swivel and the hook. This results in the sinker sitting right on the eye of the hook. The knocker rig has two advantages. It keeps the bait right on the bottom where the fish feed. Also, if the hook hangs up, the sinker will often “knock” it free, thus the name. I use this rig a lot when targeting sheepshead and snapper on Sarasota fishing charters. It is very effective. Spreader rigs separate the hooks both horizontally and vertically. Wire arms are often used. Snelled hooks are attached to the arms. The hooks then go off to the side and away from the main line. When the fish are biting, double headers are common. This rig works well fished vertically from a boat, bridge, or pier. Surf casters employ them as well. There are many different styles of hooks that anglers use when bottom fishing. Short shank live bait hooks are the most often used as they are easier to hide in the bait. Some anglers prefer a long shank hook. This is particularly true of flounder fishermen. Circle hooks are popular now as well. Circle hooks more often result in the fish being hooked in the mouth. This reduces the mortality rate among released fish. 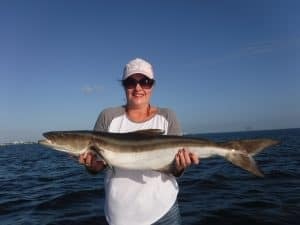 Circle hooks are mandatory in the Gulf of Mexico. The rule of thumb when choosing a hook is to match it to the size of the bait being used, not the size of the fish being targeted. A small hook in a large bait will usually not result in a hook up. Using a hook too large may hinder a natural presentation. Many large fish have been landed by anglers using small hooks, so resist the urge to use a hook that is too big. Sinkers also come in various styles. Egg, bank, and pyramid sinkers are the most commonly used in salt waters by inshore anglers. Egg sinkers work well with sliding rigs while bank sinkers are best for spreader rigs. Pyramid sinkers are primarily used by surf anglers. The amount of weight used is determined by the depth and current that the anglers is dealing with. The goal is for the weight to be just enough to hold bottom when anchored or bounce along the bottom when drifting. Bait choice runs the gamut and is generally determined by the local forage available. Just about any fresh fish caught can be cut into strips or chunks and used as bait. Check local laws to current regulations. Squid is a universal frozen bait that produces fish everywhere. Local bait shops will have other frozen baits available and will give anglers the best advice as to the bait of choice. Shrimp is king in Florida where I fish and really along the entire Gulf Coast and up the east coast to the Carolinas. Shrimp are a terrific bait live as well as fresh dead or frozen. They are the “nightcrawler of saltwater”, just about every inshore species love them. Live shrimp are hooked in the horn while dead ones are threaded on the hook. Live bait fish can certainly be used by anglers bottom fishing. Flounder fishermen use live minnows with great success. Florida bottom fishermen use live pin fish for grouper and snapper. As with any fish, live or dead, check local regulations before fishing. Anglers fishing from boats need to make a choice; whether to anchor or drift. Both methods produce and have their advantages and disadvantages. Drifting is generally preferred when anglers are seeking a school of fish in open water. Drifting allows anglers to cover a lot of water, eliminating unproductive areas quickly. Both the spreader rig and slider rig will produce for anglers when drifting. Flounder fishermen use a sliding sinker rig often. Flounder lie right on the bottom and this is an effective rig. Anglers targeting bottom fish that school up such as grunts and sheepshead will do well with the spreader rig while drifting. Many bottom species such as grouper and snapper relate to structure. This structure includes ledges, hard bottom, wrecks, and artificial reefs. Anglers targeting these species usually choose to anchor and present their baits. This is especially true on smaller pieces of bottom. Anchoring properly is critical to success when working a piece of structure. The preferred technique it to anchor so that the boat ends up just a bit up-current and up wind of the structure. Baits presented right on the edge of the structure will hopefully draw the fish out away from their protection. Anchoring is a skill that only time and experience will perfect. GPS trolling motors have helped greatly with this! Anglers bottom fishing from bridges and piers usually choose a spreader rig. It is effective in this application. Sliding sinker rigs can certainly be used, especially when cast out away from the pier or bridge. Surf fisherman do a lot of bottom fishing. Most fish caught off of the beaches are done so by anglers soaking a piece of bait on the bottom. This is true from Texas to Maine. Cut squid, cut bait fish, shrimp, and crabs are all great baits that produce a wide variety of species. 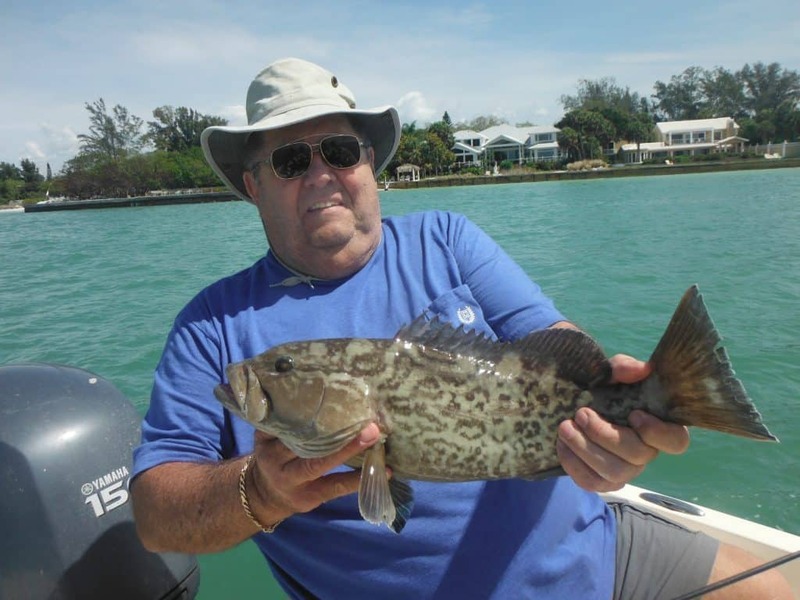 Grouper are the king of species for anglers Sarasota bottom fishing. 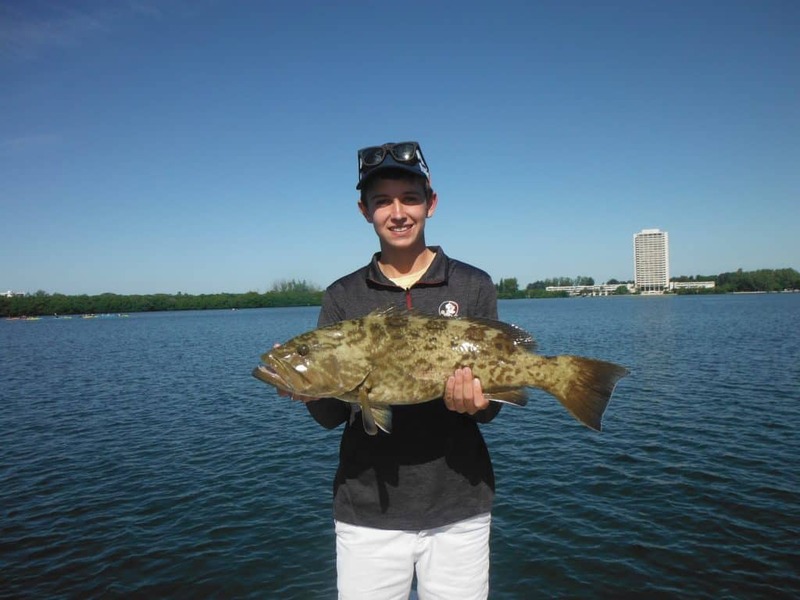 Gag grouper and red grouper are the two primary grouper species caught by Sarasota anglers. Gag grouper are caught both inshore and offshore while red grouper are primarily caught offshore. Any live or cut bait will fool grouper if presented well. Grouper are structure oriented and often hold tight to the cover. Proper anchoring is crucial. Grouper are fantastic on the dinner plate. 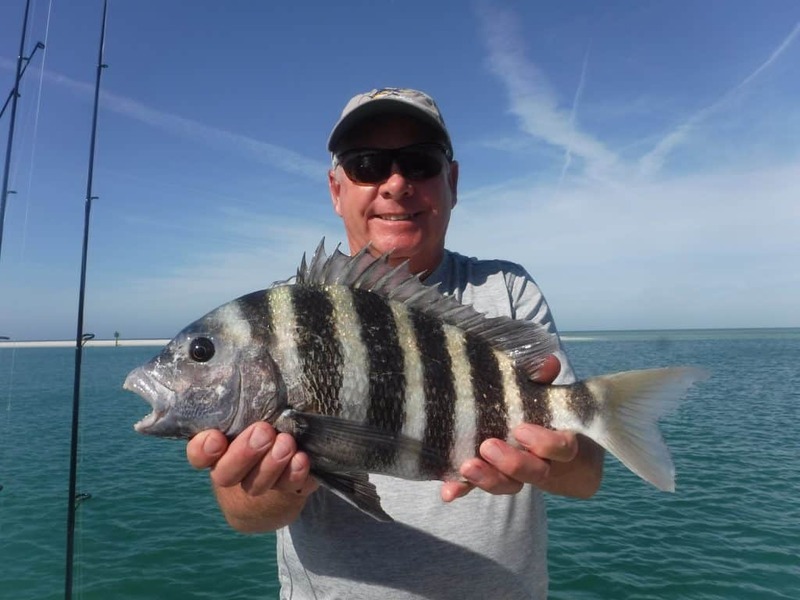 Sheepshead are a prime target of anglers bottom fishing. They are caught in the cooler months, especially January through early April. They spawn near structure in the passes and inshore Gulf of Mexico. Big Sarasota Pass, New Pass, nearby docks and bridges, along with the three inshore artificial reefs are prime spots. Sheepshead are very good eating. Mangrove snapper are a prime target of anglers Sarasota bottom fishing. These tasty saltwater panfish are found both inshore and offshore. Obviously, the larger specimens are caught in deeper water. Shrimp and small bait fish produce for inshore anglers. Snapper are caught offshore by anglers using frozen sardines, shrimp, live pilchards and pin fish, and cut bait fish and squid. 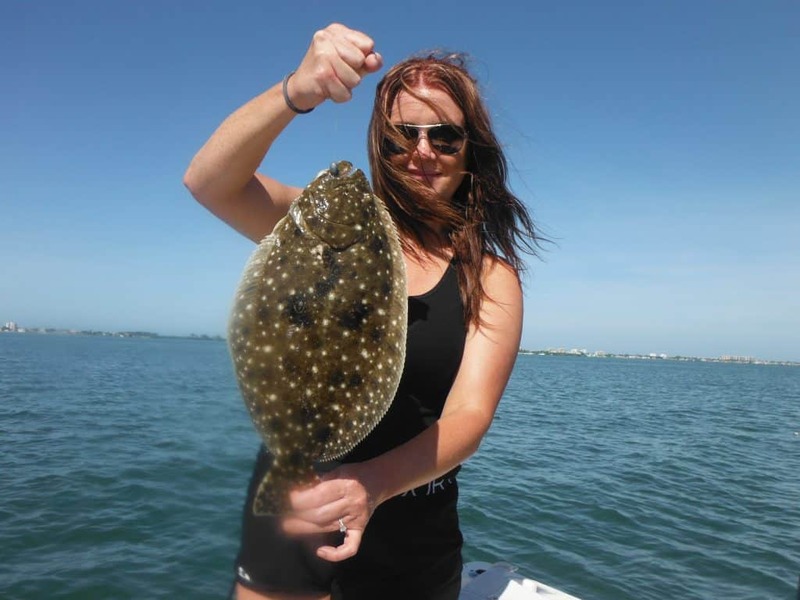 Flounder are a very popular bottom fish that are caught occasionally by anglers Sarasota bottom fishing. Flounder are rarely targeted by are more often an incidental catch. They are caught off the beaches and around structure such as docks, bridges, and submerged rocks. Shrimp, live bait fish, and cut squid. Key West grunts are an abundant species caught in the inshore Gulf of Mexico by anglers bottom fishing. They are aggressive and are generally easy to catch once located. Many an offshore fishing charter has been saved by switching from grouper and going on a “grunt hunt”! They are a but tough to clean, but are terrific eating. Grunts and grits are a staple of southern anglers! Whiting are most often caught by anglers fishing off of the Sarasota beaches. They are small but put up a good tussle on light tackle. Shrimp account for most of the whiting landed. This is a list of the best 11 Sarasota fishing reefs. These Sarasota fishing reefs are all located in Sarasota Bay and the inshore Gulf of Mexico. Sarasota County has an extensive reef program. While many of these reefs are miles offshore, there are plenty of Sarasota fishing reefs available to anglers with small boats. This article will focus on those reefs in Sarasota Bay and within a couple miles of the beaches. These reefs provide excellent fishing action on a variety of species all year long. There are eight artificial reefs in Sarasota Bay. Most of these Sarasota artificial reefs are in water around 10 feet deep. This optimizes the amount of species that will inhabit the reefs. All of these reefs will hold bottom fish such as mangrove snapper, sheepshead, and grouper. They will also attract pelagic species such as Spanish mackerel and bluefish at times. Most anglers choose to anchor when fishing these Sarasota fishing reefs. For the most part, they are small areas. This makes anchoring a more practical approach. Live bait is most often used, but frozen shrimp or cut bait can be effective as well. These reefs can be drifted while artificial lures such as jigs are plugs are cast. The best approach when anchoring on Sarasota fishing reefs is to place the boat a little bit upwind and up tied of the reef structure. For one thing, this eliminates the risk of hanging the anchor up in the structure and losing it. It also results in the bait being drifted back naturally to the fish holding structure. Tackle for fishing the reefs in Sarasota Bay is fairly straightforward. A 7 foot medium action spinning rod with 12 pound monofilament or 20 pound braided line works well. The terminal rig consists of a 24 inch piece of 30 pounds fluorocarbon leader, a hook, and just enough weight to hold the bottom. A #1/0 live bait hook is a good choice. Often times anglers can get away with just a split shot or two to get the bait down to the structure. Most of the Sarasota fishing reefs are in 8 to 10 feet of water. So, unless there is a strong current, a split shot or two will be plenty. When needed, a 1/4 ounce or 1/2 ounce egg sinker can be used. Again, the best approach is to use the least amount of weight required. This will reduce hangups and present the bait naturally. Live shrimp is undoubtedly the number one bait on Sarasota fishing reefs. Shrimp are available all year long and every species feeds on them. These baits can be hooked through the horn, which allows them to move naturally. Threading them on the hook is a better approach when targeting bottom species such as sheepshead and snapper. Frozen shrimp can be used as well. 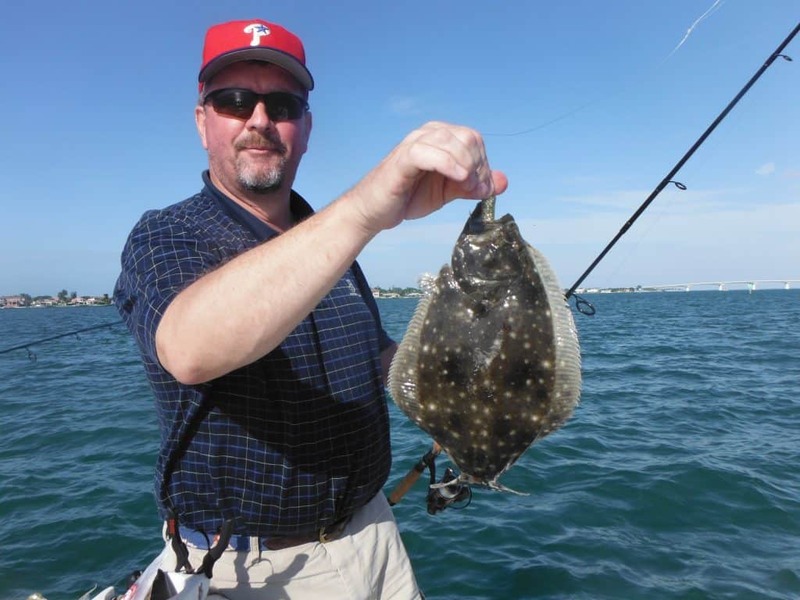 Live bait fish can be used successfully on Sarasota fishing reefs as well. They are particularly effective for catching grouper. A 2 inch pin fish or grunt will attract the larger grouper and snapper. Anglers will need to beef up the tackle when using this technique. Cut fish strips, chunks, and squid can be used to catch grouper and other bottom dwelling species. The Jonnie Walker Reef is located on the west side of Sarasota Bay just south of the Moorings. It consists of rocks, boulders, and reef balls and is located in 12 feet of water. The Jonnie Walker Reef is adjacent to some very good deep grass flat areas. It will hold most of the inshore game fish in Sarasota Bay at one time or another. The Sportfishing Anglers Club Reef is located on the west side of Sarasota Bay just off of Country Club Shores. It consists primarily of reef balls. The Sportfishing Anglers Club Reef sits in 12 feet of water with a deeper dredge hold to the west and some nice grass flats just to the south. It is a good spot for bottom fish such as sheepshead, snapper, and grouper. The Hart Reef is located on the east side of Sarasota Bay, southwest of Stephen’s Pt. It consists of concrete, FPL insulators, and reef balls. The Hart Reef is considered by many to be the best of the Sarasota fishing reefs. It lies just south of an extensive grass flat and 10 feet of water and attracts just about every inshore species including tarpon. The O.D. Miller Reef sits and New Pass right along the seawall. It is accessible to anglers fishing from the City Island fishing piers. The Miller Reef consists of concrete rubble that sits in water between 10 feet deep and 20 feet deep. This is an excellent spot for mangrove snapper and sheepshead. It is best to fish this spot when title flow is not very strong. It is difficult to fish or when the current is running very hard. The Pop Jantzen Reef sits at the south end of a large grass flat area and just north of the Ringling Causeway. It consists of concrete, FPL insulators, and reef balls. The Pop Jantzen Reef sits and 10 feet of water and there is a very deep channel just to the south of the reef. This is a very good spot to catch mangrove snapper. It is also a good spot to try on a hard south wind as bird key offer some protection. The Bully Powers Reef sits in 12 feet of water just west of Otter Key and consists of concrete and FPL insulators. It is adjacent to a very shallow grass flat and is in a good protected spot on a north west wind. It holds the normal bottom fish along with the occasional redfish, flounder, and even snook. The Jim Evans Reef lies and 10 feet of water on the south west corner of the Ringling bridge. It is accessible to anglers fishing from shore at the park. The Jim Evans Reef consists of concrete and FPL insulators. 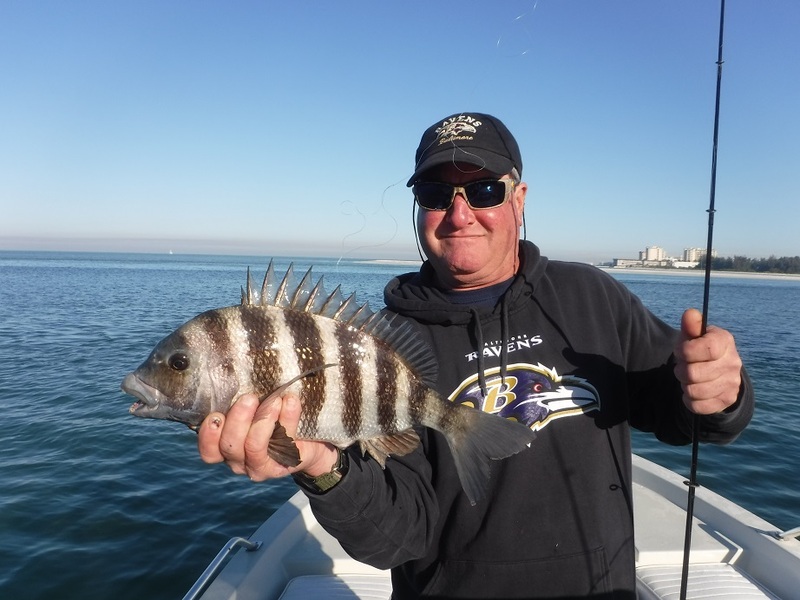 It is a very good reef for anglers targeting sheepshead. Gag grouper and mangrove snapper will also be caught there. Anglers can also cast to the Ringling Bridge pilings from the park on the west side. The Rose Coker Reef is the shallowest of the Sarasota fishing reefs, lying in 6 feet of water on the east side of Sarasota Bay just north of the Siesta Dr., Bridge. The Rose Coker Reef sits just east of a shallow grass flat. It will hold many of the inshore species including speckled trout, jacks, Spanish mackerel, along with the normal bottom species. It consists of concrete and FPL insulators. Three artificial reefs were constructed off of Lido Key just a couple miles from shore. These Sarasota fishing reefs offer outstanding fishing throughout much of the year. The bottom of the Gulf of Mexico is almost entirely sand and featureless for the most part. Therefore, any type of structure will attract fish. These artificial reefs are magnets for bait and the game fish. I work these reefs quite often on Sarasota fishing charters. Bottom fishing will produce on these reefs all year long. Mangrove snapper, Key West grunts, gag grouper, red grouper, and in season sheepshead will all hold on these artificial reefs to feed. Most anglers anchor on the reefs when bottom fishing. However, anglers can drift fish if it is not breezy. Live shrimp fished on the bottom will produce for anglers working these Sarasota fishing reefs. A 1/4 ounce or 1/2 ounce egg sinker is normally plenty to keep the bait on the bottom. Frozen shrimp can be used as well. Anglers seeking larger fish and grouper in particular will do well with a live pin fish or grunt fished on the bottom. NOTE: Anglers bottom fishing in the Gulf of Mexico are required to use circle hooks. Circle hooks reduce the mortality of fish being released as a are almost always hooked in the corner of the mouth. 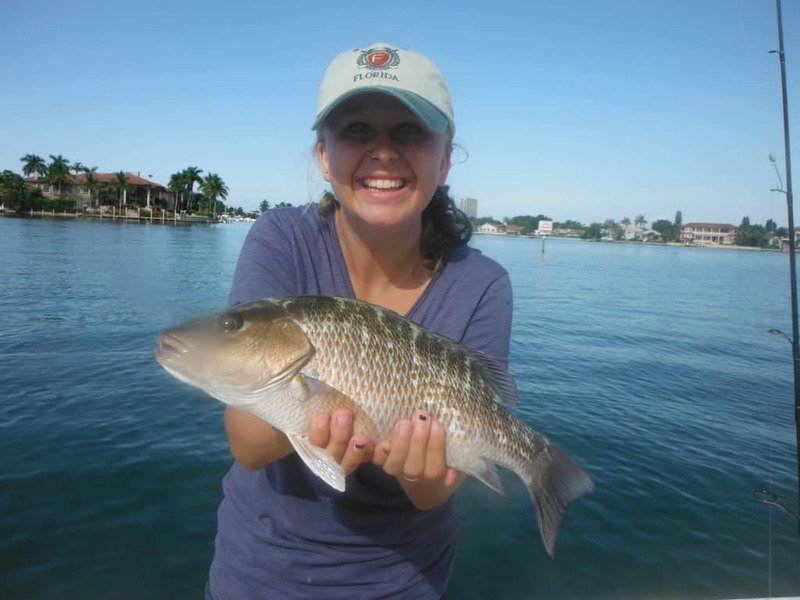 Current Florida fishing regulations can be found at the FWC website. These three artificial reefs will attract hordes of bait fish in all but the coolest months. This in turn will attract a pelagic species such as Spanish mackerel, king mackerel, cobia, sharks, and false albacore. Anglers heading deeper offshore will often stop at these inshore artificial reefs to load up on bait for the day. Anglers targeting these pelagic species can do so in several ways. Often times, fish will be seen breaking on the surface as they forage on the bait. This provides anglers with an exciting fishing opportunity as they cast lures to these actively feeding fish. Jigs, spoons, and plugs cast into the fray will normally be instantly devoured. Trolling is another method that is extremely productive on and around these Sarasota fishing reefs. 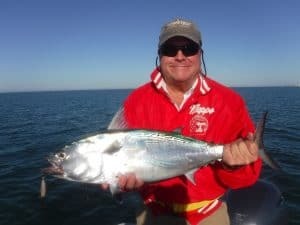 Anglers using #1 and #2 planers with a trolling spoon or plug catch some very nice king mackerel in the spring and the fall. Slow trolling with a live blue runner can produce some trophy fish, up to 50 pounds! Diving plugs will produce king mackerel, Spanish mackerel, and false albacore as well. Anglers can also anchor on the reef and chum these fish up behind the boat. This can be very exciting if a school of fish is lured to the boat. Blocks of frozen chum are normally used. However, chumming with live bait fish is a deadly method that can and produce some incredible fishing action! The Donald Roehr Reef is the closest to shore. It lies and 22 feet of water and consists of the old Orange Ave., Bridge debris. The structure is distributed in a fairly small area. It is a very good reef for sheepshead and winter and spring. It will also hold schools of very nice sized flounder in the winter. Spanish mackerel will be thick at times in the spring, summer, and fall. It is best to anchor as this is a small area to fish. 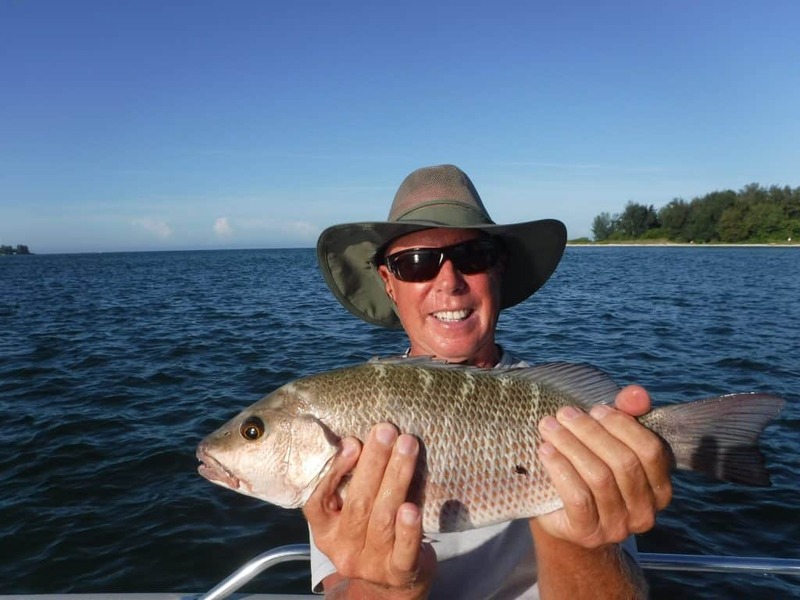 The Alan Fisher Reef is an excellent fishing spot. It sits and 30 feet of water to miles straight out of New Pass. It consists of the old New Pass bridge along with other concrete rubble. There are several distinct piles of structure. Sheepshead, snapper, and grouper fishing is excellent at times. King mackerel, Spanish mackerel, and false albacore will also hold over this reef. Anglers can sight fish, troll, drift, and anchor to catch them. It is easy to tell when the king fish bite is on as there will be quite a few boats in a small area. The Lynn Silvertooth Reef is by far the most expansive reef of the Sarasota fishing reefs. Concrete rubble, reef balls, and bridge debris is spread over a large area and 30 feet of water. There are in reality many small artificial reefs on this site. Anglers who take the time to find the spots will catch fish all year long. Bottom fishing is outstanding at the Silvertooth Reef. Sheepshead will school up heavily from January through April. They are caught mostly by anglers using live or frozen shrimp. Some very nice mangrove snapper, up to 4 pounds, are also taken there on a regular basis. Gag grouper inhabit this reef as well and are caught by anglers using live bait fish and cut bait such as frozen sardines. This is the best of the Sarasota artificial reefs to troll for king mackerel. The reason for this is the large amount of area that the structure covers. Anglers can troll both lures or live baits to achieve success. Spanish mackerel and false albacore will be thick over the reef at times as well. In conclusion, anglers seeking action, variety, and a tasty fish dinner will do well to target these top 11 Sarasota fishing reefs. Sarasota County has done a great job constructing these reefs for both local and visiting anglers. We will all do well to take advantage of this great fishing opportunity!